400 Beacon is located on the NE corner of Beacon and Gloucester, with 398 Beacon to the east, 404 Beacon (2 Gloucester) to the west, across Gloucester. and 1 Gloucester to the south, across Beacon. 400 Beacon was built ca. 1872 by Bourn & Leavitt, a partnership of carpenters Robert Tower Bourn (Bourne) and William Leavitt, one of seven houses (388-390-392-394-396-398-400 Beacon) built for George H. Peters and his partners in the firm of Edward D. Peters & Co., commission merchants, for speculative sale. Click here for an index to the deeds for 400 Beacon. On March 17, 1877, 400 Beacon was purchased from George Peters by Olivia Howard (Brown) Griffith, the wife of East India shipping merchant Meriweather Hood Griffith. They previously lived at 4 Commonwealth. 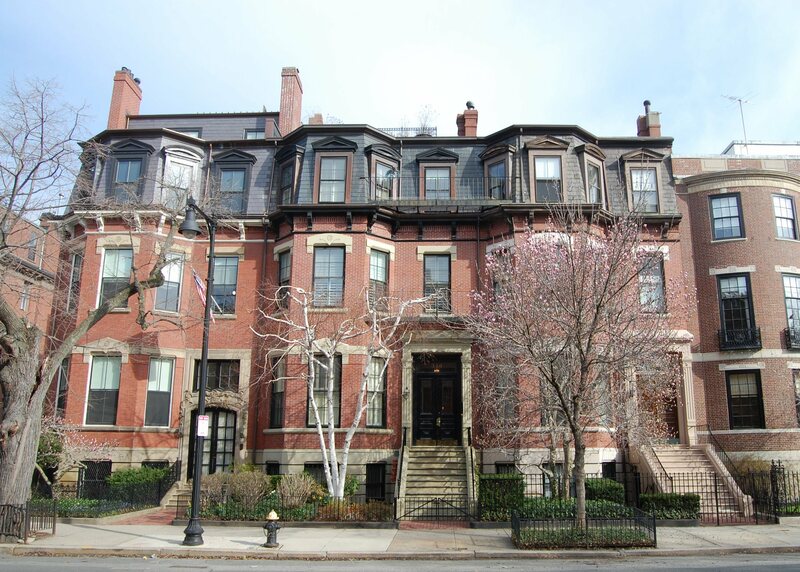 They continued to live at 400 Beacon during the 1890-1891 winter season, but moved thereafter to The Charlesgate at 535 Beacon. On August 4, 1891, 400 Beacon was purchased from Olivia Griffith by wholesale druggist Andrew Gray Weeks. He and his wife, Harriet Pitts (Pierce) Weeks, made it their home. They previously had lived at 14 Newbury. Andrew Weeks died in June 1903. Harriet Weeks continued to live at 400 Beacon. On January 26, 1907, Andrew and Harriet Weeks’s three children – Warren Bailey Potter Weeks, Andrew Gray Weeks, Jr., and Harriet Pierce (Weeks) Anthony, the wife of Silas Reed Anthony – transferred their interests in 400 Beacon to their mother. Harriet Weeks died in August of 1909. 400 Beacon was not listed in the 1910 Blue Book. On March 25, 1910, 400 Beacon was acquired from Harriet Weeks’s estate by Miss Rose Linzee Dexter. She lived at 250 Beacon. Prior to occupying 400 Beacon, Rose Dexter had it remodeled, including adding a fourth story and lowering the front entrance to street level. The remodeling was designed by Bigelow and Wadsworth. Plans for the remodeling — including partial elevations and floor plans — are included in the City of Boston Blueprints Collection in the Boston Public Library’s Arts Department (reference BIN A-5). 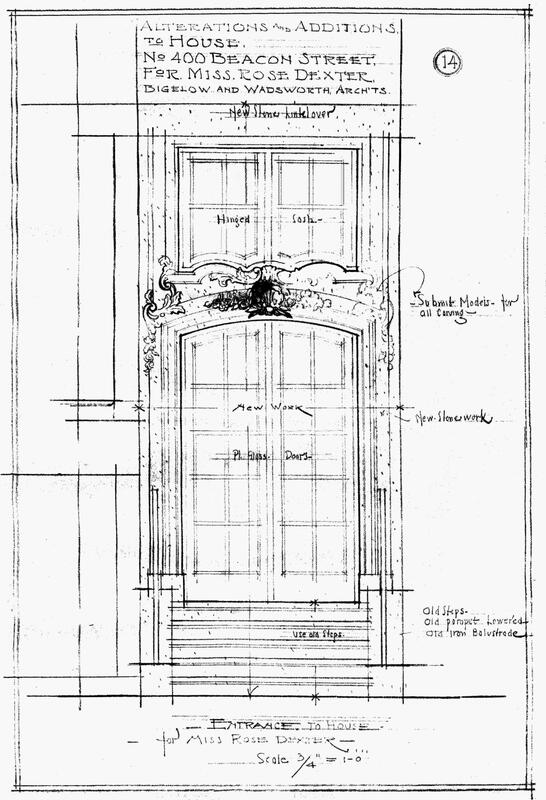 Click here to view scans of the floor plans for the 1910 remodeling. Rose Dexter had moved to 400 Beacon by the 1910-1911 winter season. In 1925, her nephew, attorney William Dexter, and his wife, Constance Van Rensselaer (Thayer) Dexter, lived at 400 Beacon with her. They had married in April of 1923 and then lived briefly at 6 West Hill Place. Prior to their marriage, he had lived at 65 Marlborough with his parents, Philip Dexter and Edith (Wood) Dexter. By the 1925-1926 winter season, William and Constance Dexter had moved to 67 Marlborough. Rose Dexter continued to live at 400 Beacon until about 1944. On July 20, 1944, 400 Beacon was purchased from James Garfield, Rose Dexter’s conservator, by Bertha R. (Cohen) Rose, the wife of Edward Rose (born Rosenthal). When they bought the house, Edward Rose was president and treasurer of the Epstein Drug Company. He subsequently became president of the Rose-Derry Company, manufacturers of mattresses and baby products, and the Beried Company, Inc., an investment firm. Edward and Bertha Rose endowed the Rose Art Museum at Brandeis University, dedicated in June of 1961. Edward Rose died in August of 1975. Bertha Rose continued to live at 400 Beacon until her death in October of 1979. On April 29, 1980, 400 Beacon was purchased from Bertha Rose’s estate by real estate investment and travel company executive Alan E. Lewis and his wife, Harriet R. Lewis. On July 6, 1981, the Lewises purchased the eastern half of Gloucester, between Beacon and Back Streets, from the City of Boston. In the late 19th Century, when it developed its land on the north side of Beacon, the Boston and Roxbury Mill Corporation had retained the land west of 400 Beacon between Beacon and Back Streets, as a privately owned extension of Gloucester, 40 feet in width. In October of 1894, it had sold the western half of this private way to Susan Loring, wife of William Caleb Loring, who owned the abutting property at 2 Gloucester (404 Beacon). 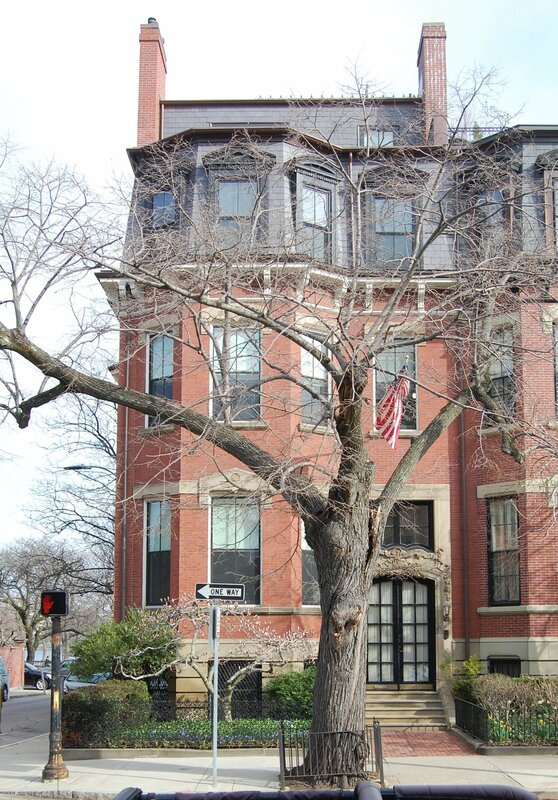 The eastern half had remained the property of the corporation and in May of 1895, the City of Boston designated the extension of Gloucester between Beacon and Back Streets as a public street. The western half, however, remained the Lorings’ property. 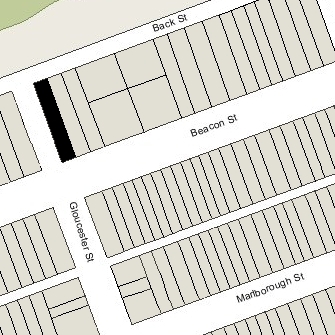 In May of 1981, the City declared the extension of Gloucester between Beacon and Back Streets as no longer needed for public purposes and sold the eastern half of the street to Alan and Harriet Lewis. 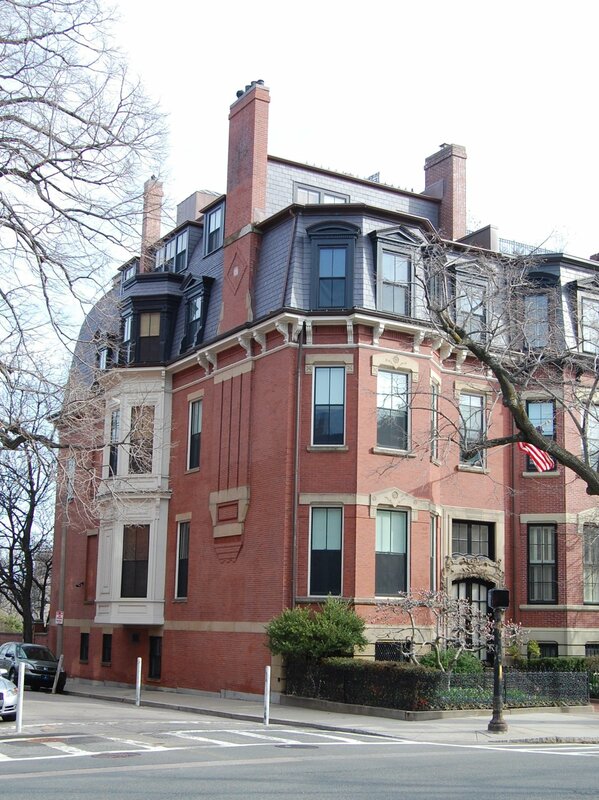 On December 19/20, 1990, the Lewises transferred 400 Beacon and the eastern half of Gloucester Street between Beacon and Back Street to themselves as trustees of The Lewis Realty Trust I. 400 Beacon remained a single-family dwelling in 2017.